In the beginning, before Perry had a rock, Southport High School had a major renovation and a large rock was placed in front of their school. The rock was painted red for a source of pride and school spirit. 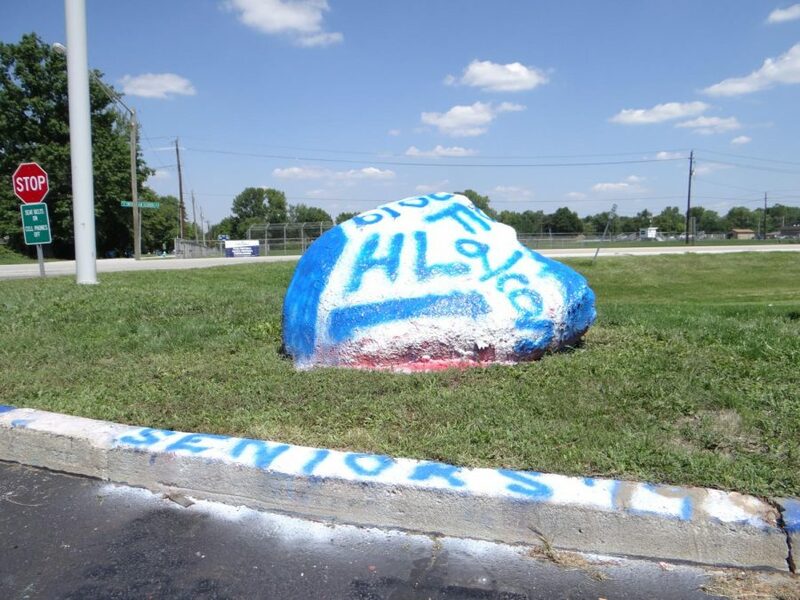 For many years, PMHS students would participate in painting the rock blue, especially during the week of the Southport vs. Perry Meridian football game. “Unfortunately over the years, since Perry Meridian didn’t have a rock, retaliation resulted in damaged property on both sides,” recounted Ed Henry, principal of Perry Meridian High School from 1995 to 2005. Henry realized the culture needed to be changed, so, with the help of a parent, he agreed to have Perry’s own rock placed in front of the school. With support from the Southport High School principal at the time, and the board in control of school destruction, it was agreed to, “look the other way,” as Henry put it, on what happens to the rock, restricting rivalry actions to only the rock and not school property. The rest, as they say, is history. The tradition of dousing the opposing school’s rock in paint, as well as various sentiments and messages, began. In the years since the rock was put into place, many wild memories were made and have been well-documented; many by PMHS staff. One such memory included the rock being transported straight to Southport High School. It was then that Henry was informed the Perry Meridian rock was residing on the football field. “I said, ‘Well, we’ll teach them to be innovative and creative It does have its downside!’” the former principal said. Former Perry Meridian Principal Joan Ellis has very fond memories of the different situations the rock has experienced. Oddly enough, Principal Ellis was in contact with an alumnus who owned a Bobcat bulldozer. The bulldozer worked magic, and the rock was revealed to Perry yet again within five minutes.